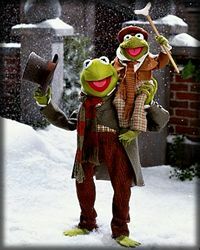 The Muppet Christmas Carol is probably my all-time favorite Christmas movie. My brother and I watched it countless times when we were growing up, and now I am thrilled that my Bees love it as much as we did. I'm not gonna pretend. The Muppets make me cry. Every time. Little froggy Tiny Tim sings a song that has turned into a prayer from my heart. The lyrics are simple, yet so full of hope and love and Meaning. Its words are such that, had I planned it a little better, I would have read to Jeremy at our wedding. Oh my heart! Some water filled my eyes and spilled over!